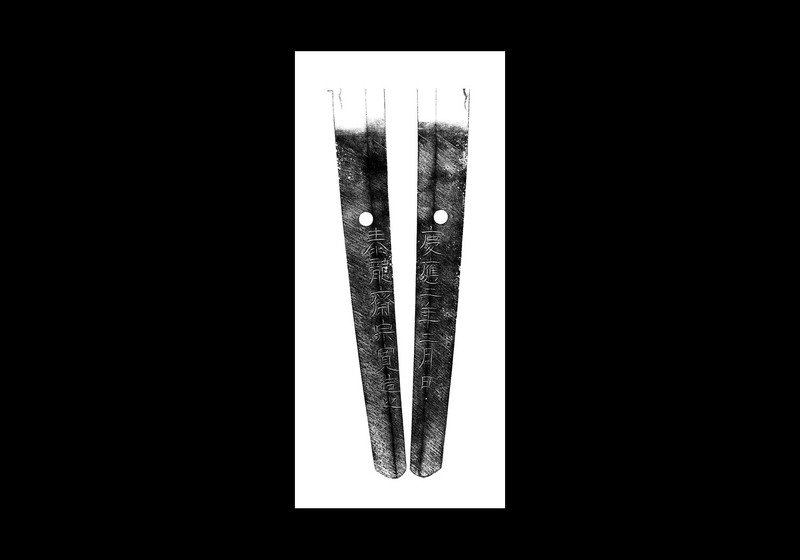 One of the most important sword smiths of the late Edo period was Koyama Munetsugu (固山宗次). It is generally acknowledged that his best student was Tairyûsai Munehiro (泰龍斎宗寛) who was also known as Tairyûsai Sôkan (泰龍斎宗寛). Sôkan (宗寛) was born in Shirakawa and lived near the Abukuma (阿武隈) River. He became a member of the Koyama Munetsugu Mon (固山宗次門) when he lived in Edo Fukagawa Hakozaki. His known works begin around Kôka 4 (1847). His early works are made in much the same style as his teacher, Munetsugu (宗次). In 1854 he changed his name to Tairyûsai Sôkan (泰龍斎宗寛). At that time, he also changed his style of workmanship and created his own individual style. He died in 1883. He was the most skilled among the students of the Koyama Munetsugu Mon (固山宗次門). He exclusively followed the Bizen tradition in his works. His works in his youth, when he used Abukumagawa (阿武隈川) in his mei, have a yakiba that is exactly like that of his teacher, Munetsugu (宗次). In other words, he tempered with a robust choji hamon with indentations or undulations. Later his hamon became a uniform ko-gumone choji midare in which his own individualism emerged. He was skilled at horimono and many of his works have ji utsuri that stands out. When we view his swords and study the finish of the nakago, the way he did the mei inscription, the formation of the yakiba, etc. ; we can surmise that Sôkan (宗寛) was probably a very methodical person. Although he made the yasurime on the nakago one stroke at a time, he made these with great diligence, without any irregularities. It is beautiful. From Ansei 4 (1857) on he signed in reishotai style (ancient squared kanji characters). Even though he signed his mei in reishotai, it has the aura of the work of a master calligrapher. 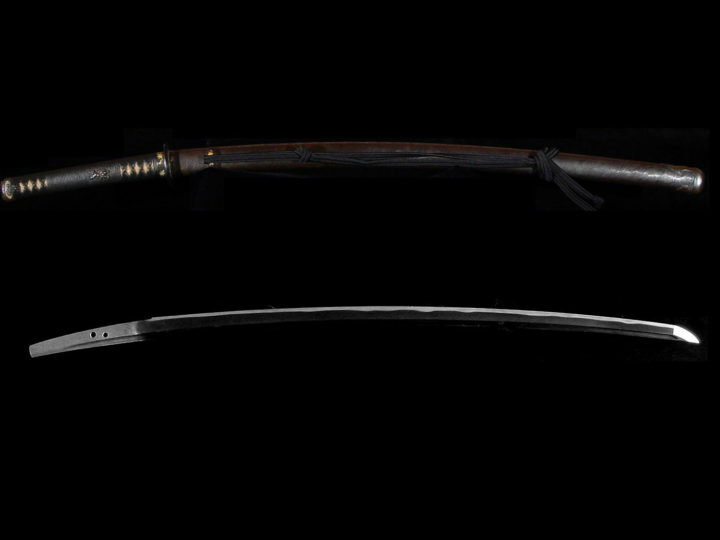 The number of years that swordsmiths working at that time could make swords was limited due to the proscription against wearing swords that was passed in the beginning of the Meiji era. However, the fact that Sôkan (宗寛) left many swords was probably due to the fact that during his life his name and reputation were highly respected and he was regarded as being a first class tôkô (swordsmith). SUGATA: His works are made with an impressive construction of a wide body and a high shinogi. 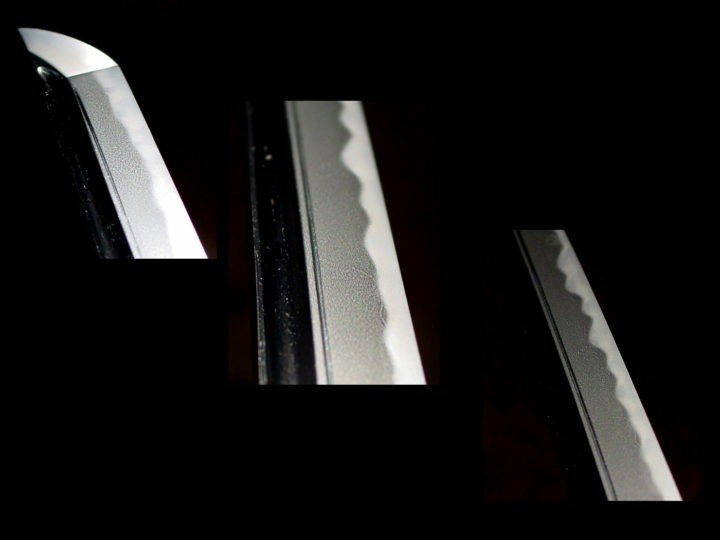 The kissaki can be extended as necessary in keeping with the overall size of the blade. This is particularly true of his later works. He also produced many blades that have a mitsu-mune. Many of his blades are impressive for their size. JITETSU: The jitetsu is excellent being a very tight ko-mokume or ko-itame in the muji style. It will be sprinkled with ji-nie. His jitetsu is bright and clear. He was also adept at making ji-utsuri and many of his blades have this characteristic. HAMON: In his early years, he made a Bizen choji-midare hamon like his teacher Koyama Munetsugu (固山宗次). 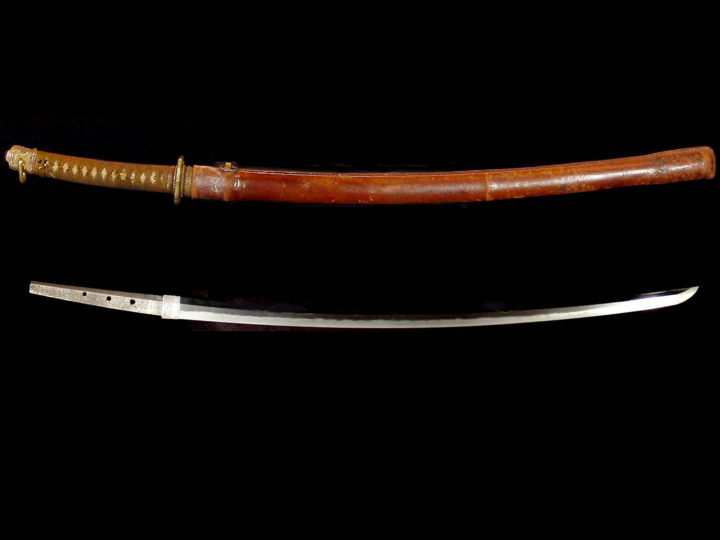 Later his hamon became a uniform ko-gunome choji midare with yakigashira in a level line. Thus, his individualism emerged. 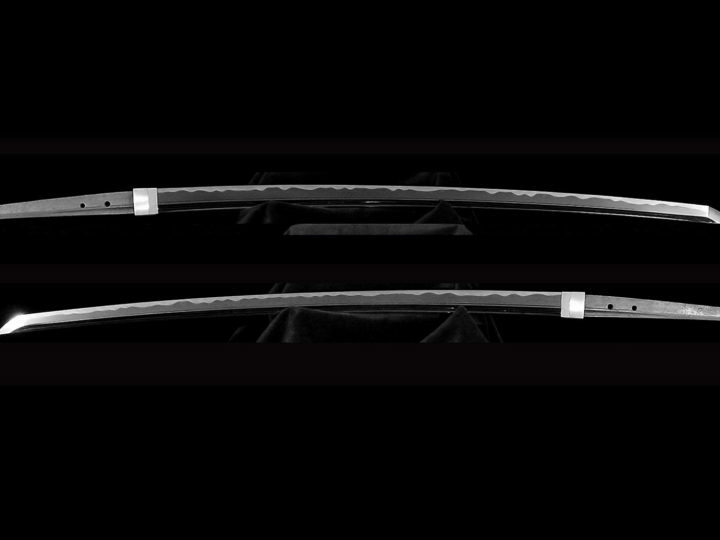 Occasionally we find a blade made with a suguha hamon. His hamon is nioi based. BÔSHI: Generally, the bôshi is midare-komi and ko-maru. The kaeri can be long. HORIMONO: He was very skilled at horimono and many of his blades have very nice carvings done by him. He also did horimono for Koyama Munetsugu (固山宗次) and is thought to have done the horimono on Munetsugu’s utsushi of the Koryu Kagemitsu. NAKAGO: Sôkan’s (宗寛) nakago is unique in that the yasurimei begin with jiri (horizontal) at first to be replaced by keshô and then sujikai. The yasurimei on the back are finished in the same manner. They are done with great patience and skill. MEI: His early works are signed in much the same style as his teacher, Munetsugu (宗次). In 1854 he changed his name to Tairyûsai Sôkan (泰龍斎宗寛). From Ansei 4 (1857) on he signed in reishotai style (ancient squared kanji characters).